Start by working with reputable contractors, and look for personal recommendations if you can. No matter how good the initial interview is, it’s a good idea to trust people gradually and to limit the risk from misunderstandings or malice. Part of learning how to work together is building your trust in your new assistant’s skills and ethics. Break your tasks down into smaller tasks that people can do with limited access to your information. For example, if you’re delegating tasks related to updating website, you might ask people to take a look at specific pages and e-mail you text that you can copy and paste into your website. If they do a good job and you feel good about working with them, you might give them access to the website so that they can edit the pages themselves. Here’s another example. 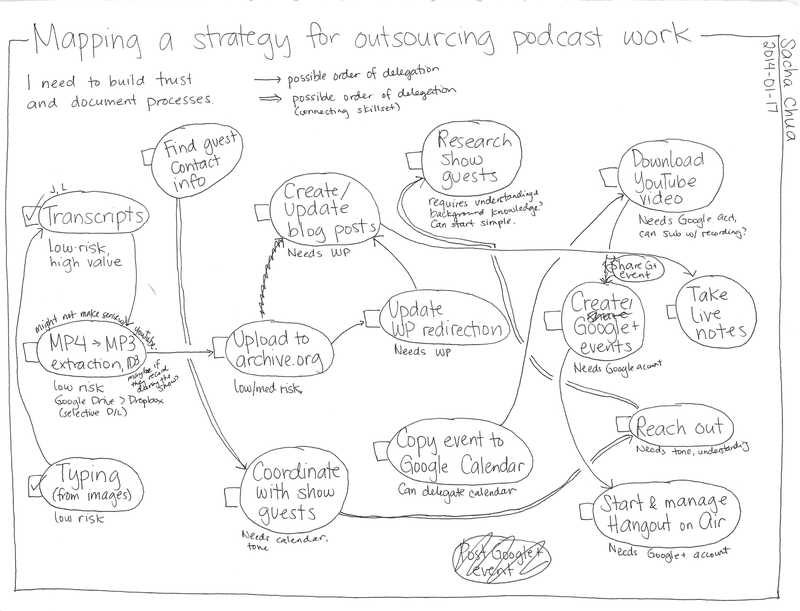 I wanted to delegate parts of my podcasting process, but I didn’t want to give people access to my blog or my Google account right away. So I started with typing and transcripts. When that worked out smoothly, I moved to extracting and uploading the MP3. That was fine, so I gave my assistant access to my blog, and now I can just ask him to post show notes and stuff happens. 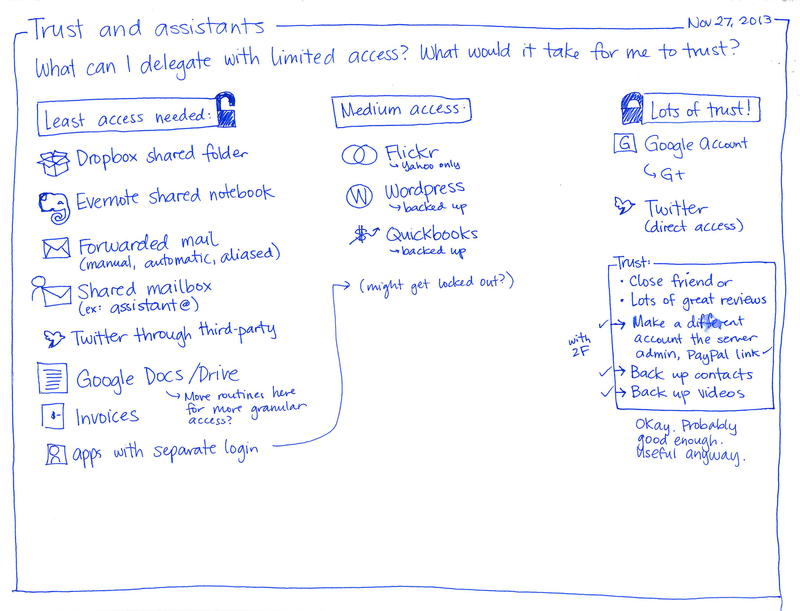 I still haven’t given any assistant access to my Google account, but maybe someday. Think about the smaller tasks that make up your process. Try delegating the low-risk tasks first. Plan how you can create a sequence of tasks that starts with clear instructions and limited access. 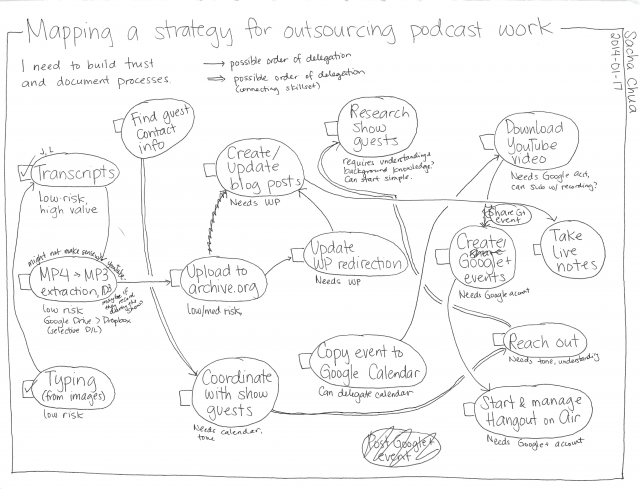 As you become more comfortable with your assistant and with delegation, you can assign larger chunks of tasks, until you get to the point where they have access to everything they need. Think about the accounts you have and the risk involved in sharing them. Write the tasks down on index cards, sticky notes, or a piece of paper. Index cards and sticky notes are easier to move around, but you can draw arrows on a piece of paper if that’s what you have handy. Note which accounts are needed, and move the tasks until you come up with a good sequence. You can also create a spreadsheet that has tasks as rows and accounts as columns. Mark the accounts that each task needs, and sort the tasks accordingly. Make sure you use a password manager like LastPass or KeePass when sharing accounts, so you’re not e-mailing passwords around. I use LastPass to share account information with assistants. LastPass also lets me share a password without giving it, and to review who has access to the accounts I’ve shared. It’s not bulletproof, but it adds a little security. What about guarding against mistakes or intentional actions? Think about ways you can limit people’s access to only the things they really need to complete the task. While e-mail is not a particularly efficient way to collaborate, it’s one way of limiting people’s access to your files and keeping a history at the same time. Just e-mail them the information they need to work on, and ask them to e-mail you back. Tools can help you give more specific access to your accounts or files. For example, you may not want to share your Twitter account because people can use Twitter to log on to many other services, not just twitter.com. However, you can use something like HootSuite, Buffer, or GrabInbox to give other people a separate login that they can use to post stuff as you without knowing your Twitter password. Google Drive allows you to share specific folders or documents with people, and you can give them viewing or editing privileges. Dropbox lets you share specific folders, too. Limiting your accounts can help you trust people with them, too. For example, you might create a separate account just for your assistant, and give that account less access than you have. Alternatively, you can create an admin account and remove the administrative privileges from your account. Backups can go a long way to make it easier for you to trust people with access to your accounts, since you know that you can recover your data in case people make mistakes or intentionally delete files. To guard against people modifying files maliciously (such as encrypting the data or replacing it with an incorrect copy), be sure to keep older versions of the files, not just the latest one. Dropbox has the ability to restore older versions of a file or undelete files, so you may find that handy. Google Drive can also keep older versions of files, and only the owner of a file can delete it. Logs can also help you make sure assistants are doing only what they’re supposed to be doing. While logs are not fool-proof, they can help you catch suspicious activity. For example, you might regularly review your Google account history to see if people have logged in from locations you didn’t expect. If you delegate, there’s always a chance that someone’s going to break your trust by accident or by design. Still, there are ways you can build that trust in people’s skills and ethics, and that’s important if you’re going to trust wisely. Good luck!